﻿The Arsenal Accelerator is Here! Marla's been working to build a new startup accelerator program in Hampton Roads. The Arsenal is a high-intensity, limited duration program based on lean startup methodology. This post is going to use the word "value" a lot. I apologize in advance. There's a sign hanging in my apartment building's elevator. It's a note from the management informing dwellers of upcoming construction. It greets us, "Dear Valued Resident," a term that makes me wonder, "how much am I really worth?" There's the value of my rent, a particular dollar amount that they consistently receive from me. There's the value of my occupancy, important because without me and the other tenants, they'd have a lifeless vacant building. There's the value of my belongings, the sum total of my material possessions that also reside within this building. There's the value of my life, and as far as insurance goes, there's probably a also a claim value should the structure itself or another resident be responsible for wrongdoing (or worse). Too morbid? Ok, let's return to the word "value". If I'm valued, does that mean the management company values me? In this sense of the word, do they put me on some list of things about which they care, next to being kind to strangers and buying products made in the USA? I've experienced some pretty fantastic startup communities this year and am more convinced than ever that it matters not where you build your business, but with whom you build it. I'm not just talking about co-founders or early employees, interns or investors. The Startup America folks hit the nail on the head when they categorized people as champions, though I'm not defining a champion in quite the same way as they do. For me, a champion is anyone who has made a contribution to your success. Find the champions for your venture. It could be your family and friends, or it can be your advisors and consultants. It can even be your competitors. Any person from whom you can learn and grow is a champion for your business. People that introduce you to important contacts; or warn you about bad experiences with vendors; your first pilot users, or your 100th paying customer - they are your champions. Remember that people are what matters. You're building something to help/fix/solve/support/promote/advance another person. Even if you're selling a B2B solution, it's the people that buy, install and integrate your product that matter. On that note, I'd like to extend a sincere thanks to my champions from this past year. In my first official full year as an independent contractor without an "employer", I simply could not have made it without you! Feb 2013, Hampton, VA - We laughed, we cried, we created foundational marketing materials. And it's happening again, this time in Washtington DC. The venue, PunchRock. The people, social entrepreneurs from civic, green, ecommerce, B2B & you, of course. Early bird registration is open now! Take advantage of $100 off the cost of this jam-packed 4 session workshop. You'll sweat out some serious marketing collateral and might even walk away a little addicted to verbage. Spreading the Marketing Love - Free Sessions! Over at hiremarla.com, I'm running an interesting experiment. I'm asking city mayors to pitch me their cities in the most creative way they can dream up. Why am I doing this? Because after living abroad for five years and working to launch all kinds of new ventures, I'm now my favorite new venture (but not the only one, more on that later) and I need to be launched in the US. Who better to acquire me than the mayor of an awesome city? As much as it's about me finding a home, it's also about me doing what I do best for some very worthy causes. I'm giving away several hours of marketing & outreach strategic sessions to one local non-profit in the city that I select. I'm also giving away consulting hours to entrepreneurs and others who can help me reach city mayors. These Dear Mayor Foot Soldiers are my best friends over the next few months, getting me introduced to important city workers and uber-connected quasi-governmental creative types. What do the mayors and their staff need to pitch? I have five main criteria that I'm looking for in a city: great food; good public transportation; quality business networking; rampant arts & culture; and, environmental friendliness. However a mayor wants to answer to these criteria, s/he is invited. It can be through song, video, poem, dance, sculpture, or anything else. The only caveat is that a digital representation of the art must fit in my email inbox. These five criteria make cities tick, in my opinion. They also make for incredible points of inspiration to fledgling entrepreneurs like myself and my clients. Which brings me to the last of my list of giveaways - a one-hour session for freelancers, telecommuting workers, work-from-home-ers and other highly mobile workers. I'm working on a new venture that serves this ever growing, ever moving workforce, but I need feedback from individuals in that community in order to design the product just right. If you identify with this cohort, please take my short 10 question survey. In return, I'll spend a good hour on the phone or in person helping you with marketing, branding, writing, editing, media buying, planning, you name it! If it's practical marketing advice you need, I'll give it to you for free for an hour. 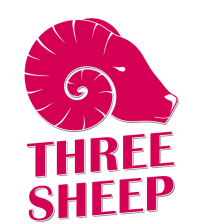 There you have it - 3 ways to get free marketing advice from Marla. NASA hasn't had it easy over the last few years. Budget cuts, lack of interest in the space program, and the retirement of the shuttle have all taken a toll on the 54 year old organization and its public image. With today's successful landing of the NASA Curiosity rover on Mars, the resulting chatter and positive engagement of traditional news media and online audiences is certainly well deserved. In what seems like just a few months, NASA has managed to recapture the attention of millions of people through a well-executed communications campaign consisting of equal parts drama, action, and geeky fandom. Largely carried out on social media, the NASA Curiosity Rover campaign first caught our attention with its captivating 7 Minutes of Terror video. Clever scripting, beautifully rendered graphics, and emotional music all helped the video go viral. Originally uploaded by NASA's California Jet Propulsion Laboratory in mid-June, it currently has well over 1 million views, not to mention several hundred thousand views scattered among copies of the video posted on other accounts. If you're not one of the almost 400,000 people following along in real time, this week is an especially exciting period to follow NASA Curiosity's Twitter account. Just in the last week, the number of @MarsCuriosity followers has surged from 125K to 344K. It's unclear who is behind writing the first-person messages from space, but whoever it is, s/he has a snarky sense of humor and a playful approach to writing digestible science content. It's important to note that this campaign didn't start with producing the viral video (likely months of planning in and of itself). Curiosity's twitter account started all the way back in 2008 - a whopping four years ago. 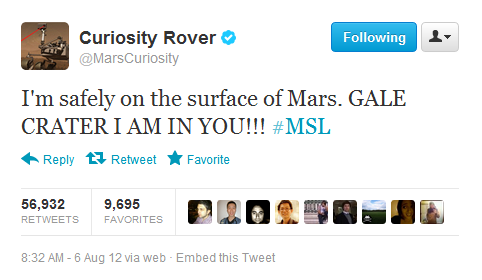 Yes, @MarsCuriosity has been tweeting for four years ladies and gentlemen (longer than @aplusk, but not @britneyspears). Twitter wasn't the only method to engage with the audience; as with any good integrated approach, NASA also regularly issued press releases and as a result received no small amount of press coverage for Curiosity's mission to mars. One can assume that NASA began planning Curiosity's marketing endeavors not long after they decided to plan the mission itself. As the public's interest in science wanes, effectively managing such a wide spread of social media, public relations, and clever communications is no small feat, even for such a large organization. Approachable, consistent, and casual language helped NASA put forward a friendly, unpretentious face. While many an internet sensation have popped and fizzled, NASA demonstrates that taking a calculated, thoughtful approach to marketing strategy does pay off over the long term. It's not rocket science, or maybe, it is?